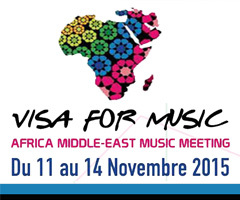 The evening showcases program of Visa For Music 2015 included parallel concerts at SALLE DE LA RENAISSANCE and THÉ TRE NATIONAL MOHAMMED V. The excited audience which consisted of active young people – music fans from Dark and North Africa turned the concerts into dance parties. Among the most famous musicians and bands from the region can be mentioned Gabacho Marocconection (Morocco, Spain, France), Malika Zarra (Morocco/USA), Jbara (Morocco), Djmawi Africa (Algeria), Tarband (Sweden), Alida Almeida (Cape Verde). My professional interest in music and culture of Maghreb determined the prior acquaintance with any of the introduced projects and musicians. In this sense, I would like to mention the project "Safar" of Imed Alibi (Tunisia), Nadia Kaless Trio (Tunisia / France), Ali Faiq & Emarg Experien (Morocco), Egyptian Project (Egypt / France) and the Moroccan soul singer Oum, who held a concert on Sofia stage on November 30, 2015 within the "Days of Morocco in Bulgaria". At the night showcases program, covering the area of the famous night club and cultural center in Rabat, LE GRAND COMPTOIR, the focus was set on the various electro-acoustic projects as Arash Khalatbari (France / Iran), La Bronze (Canada) 7 Estrelo (Brazil) Samifati (France / Morocco). In a significant part of the projects of Visa For Music joint music-making of local and Western musicians could be linked to the natural processes of interpenetration between different cultures. These are the essential dimensions of musique du monde as hybrid music in the context of the idea of "orientalisation" Western culture, "Westernization" of oriental cultures. In this kind of intercultural dialogue the idea of self-awareness and self-understanding by knowing and understanding the other is being designed. Turning to the members of the prestigious jury of the Visa For Music, I would mention the names of Patrick De Groote - European Forum of Worldwide Music Festivals, Bernard Aubert - Babel Med Music, Jose Da Silva - Lusafrica and others. The positioning of the second edition of Visa For Music 2015 as a world class event in the music industry is a fact. Often, looking behind the scenes of such formats we are asking who is behind this. This is Brahim El Mazned a team of three people. Working in the field of the music industry for 20 years, he is able to closely monitor the development of musical activities on the African continent. Having found the inability of a number of quality musicians to showcase their music to the world, the director of Visa For Music examines his own project about five years to reach the moment of its occurrence in 2014. Looking through the prism of marketing positioning, we can glimpse in its second edition already established a successful brand for the music industry with a closed cycle, called Visa For Music and bearing the potential of Visa For Music Industry. We can only wish the agreed partnership of Master's program "Management of the music industry" at the NMA "Professor. Pancho Vladigerov" with Visa For Music to launch a number of cooperative projects to stimulate the link between education and music industries which is outlined in my previous post. Special thanks to Brahim El Mazned who wholly subsidized to ensure my presence Visa For Music 2015!